SterJo FileZilla Decryptor instantly recovers and decrypts forgotten FileZilla passwords for all FTP sites stored by FileZilla Client. The application is lightweight and doesn't require much computer resources like CPU or RAM. Also it is very simple to use it and doesn't have any advanced settings. The interface is based on a small window where the passwords are decoded and has a few buttons only. 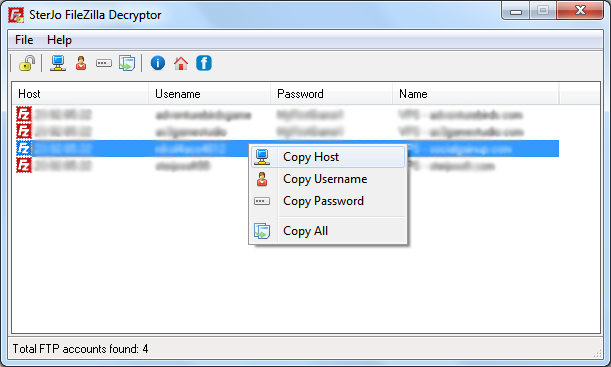 How is SterJo FileZilla Decryptor working? Remembering all FileZilla logins isn't so easy at all. Having a software that could recover all your forgotten FileZilla passwords could be a lifesaver sometimes. SterJo FileZilla Decryptor is one of those tools. If you find yourself in a situation like this then just run SterJo FileZilla Decryptor and click "Decrypt FileZilla Passwords" button. All your saved ftp logins will be decoded immediately. Starting with version 3.10, FileZilla have changed the password storing method from plain text to encrypted, so this application will NOT work on older FileZilla Clients. SterJo FileZilla Decryptor works on all Windows platform starting from Windows XP to the latest Windows 10 where at least FileZilla Client 3.10 or above is installed.